These articles we have written about the sanctuary were originally published in the "Morning Star Herald" run by Light in Darkness Ministry. These newsletters are available in PDF on the "Morning Star Training Center" page. We have chosen to make them available here for easier reading online. Jim was a good boy when he was little, but as he grew up he got into bad company. He lied; he stole, and got into all kinds of trouble. Again and again his parents pleaded with him to change his life around and turn toward the right. But the more they pleaded, the worse things got until finally, in a fit of anger, he yelled “I’ve had enough! I’ll never darken your door or come into your house as long as I live!” With that, he packed his suitcase and ran off. But life in the world wasn’t as fun as he thought it would be. It wasn’t easy for a dishonest boy to keep a job, and it wasn’t very long until he was down and out. “Go back, Go back,” said the little voice. He mailed the letter, and on the first day of the next month, he took the train that went past his home. As he came closer, his heart beat faster and faster with nervous anticipation. At last the train rounded the last bend. And there on the clothesline were hanging not one, but seven white blankets. The wilderness sanctuary was surrounded by a wall made of “fine” or white linen that was hung on brass pillars. (Ex. 27:9-18). This wall of white linen represents Christ’s robe of righteousness that He gives as a free gift to each faithful person that comes to Him in faith and repents of his sins. 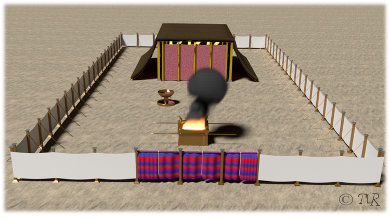 When we do this, God takes away our “filthy rags” of “self-righteousness” and clothes us with Christ’s beautiful and clean robe of righteousness.The wilderness sanctuary was surrounded by a wall made of “fine” or white linen that was hung on brass pillars. (Ex. 27:9-18). This wall of white linen represents Christ’s robe of righteousness that He gives as a free gift to each faithful person that comes to Him in faith and repents of his sins. When we do this, God takes away our “filthy rags” of “self-righteousness” and clothes us with Christ’s beautiful and clean robe of righteousness. The Bible says He take away our filthy rags of self-righteousness and give us His spotless robe of righteousness. This is what God’s true church will be wearing. This coming to Christ and confessing our sins, is the first step in the “sanctuary path” back to the throne of God. We thanked him, and as we pulled onto the interstate we watched to see if he had made the special trip just for us or if he would turn around and go back the way we came. We saw his taillights disappear under the overpass but they never came out on the other side. Had it been our guardian angel? A year later as we drove through the same area again, this time on the interstate, we looked for the exit/overpass with all the lights. It isn’t there. There were only cow pastures. We feel sure that God had sent an angel to not only provide an on-ramp to the interstate, but to also show us the way. Some of us may never get to see our guardian angel here on earth, but God has a way marked out for all of us. We may find safety by following the pathway laid out for us in the wilderness sanctuary model. It shows the pathway out of this dark world of sin and details the waymarks to eternal life. Psalm 77:13 says, Thy way, O God, is in the sanctuary: who is so great a God as our God? Just as the sanctuary had only one gate or door, Jesus is the only way to salvation. (Devil charms, penance, image worship, relics, self-scourgings, -- even our own good works alone, are useless.) Our only hope of salvation is Jesus. This door was made of linen hangings that were blue, purple, and scarlet in color and matched the colors of the veil in the tabernacle itself. So for a person to start walking this sanctuary “path to the Throne of God” (“to come to God” and be saved) – the very first thing that they have to do is to leave the “outer darkness” of the world and enter the Sanctuary. The very first step in this process is for them to walk “through” this doorway that represents Christ – in other words, they must come to a knowledge of Jesus Christ – they need to be introduced to the Saviour! 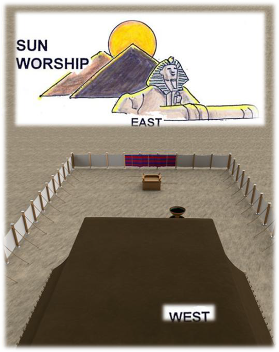 As we walk the sanctuary path (from East to West), we must make a conscious decision to turn our back on the pagan worship practices and sun worship of the east and choose instead to worship Jesus the Son of God. There are only two ways that can be traveled – the Broadway or the Narrow Way. Jesus said, Enter ye in at the strait gate: for wide is the gate, and broad is the way, that leadeth to destruction, and many there be which go in thereat: because strait is the gate, and narrow is the way, which leadeth unto life, and few there be that find it. Matthew 7:13, 14. Will you choose to turn your back on the things of this world and turn your eyes upon Jesus? Won’t you follow the way to safety? In the Bible “brass” is used to represent humanity or human flesh (Jer. 6:28; Eze. 22:18; 24:11,12; Eze. 27:13). But brass that has been melted and purified doesn’t contain impurities and can also be used to represent Jesus Christ (Rev. 1:15) who was “God manifest in the flesh” and without sin.